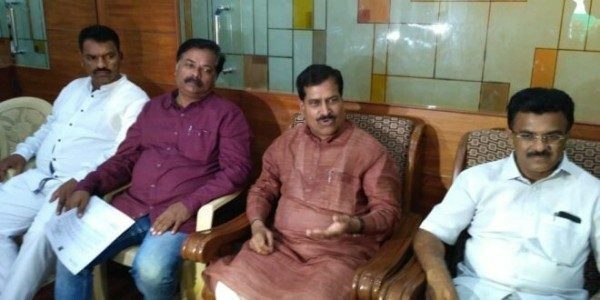 All the roads in Belagavi, main roads and by lanes all have gone horribly bad and if the state govt does not allocate 200 crore immediately for the repairs then we will be forced to call a Belagavi bandh, said MLA Abhay Patil in a joint press conference called by MP Suresh Angadi. If the roads are not repaired it will be very difficult for the govt to run the winter session, Patil added. I have been following the matter with the govt and have written 4 times but there has been no reply from the govt on this. Suresh Angadi said, all the roads are in a bad state and the govt does not look concerned about the citizens and their plight. What happened to MP’s budget since last 5, 10 years ? Why these elected reps are putting citizens in trouble by announcing the Bandh. Instead they must go on indefinite hunger strike till their demands are met. Last govt has invested some crores of rupees but no good quality just it was a formality of work.Now new govt again investment on roads of Rs.200 crores.Again if next year samething repeats then again 300 crores if not belgaum bandh is this the solution. I do honestly agree with Sudhin. Most of these crooks fight for the position in political system to put their hands on taxpayers money to divert that money into their own pockets as politicians who have no shame, guilt or self consciousness but just self greed and aim to get rich quick. And I said most because there may be someone who might be doing good job to lift up the community by doing good deeds with self sacrifice knowing that they represent people who elected them. Keep on, keep it on all the pressure on the state government until they feel the pain that citizen of Belgavi is feeling right now with horrible condition of those roads. Wake those elected state government officials, who might be in coma not realizing what goes around them.